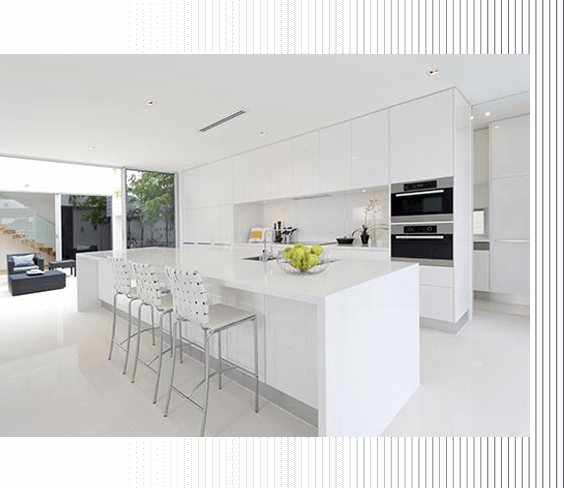 Welcome to AOK Kitchens, a Melbourne based kitchen manufacturing company with over 20 years’ experience. We can design your new kitchen and all cabinets to suit your home and lifestyle, which makes us the leading kitchen manufacturers in Melbourne. Kitchen cupboards and cabinets need to be functionally smart as well as aesthetically pleasing, which we ensure in all the work we do. AOK Kitchens can provide the finest kitchen and joinery along with expert advice for your kitchen renovation from beginning to end, helping you choose the right kitchen layout, design and finishes to suit your specific needs. Our Melbourne designer kitchens are only made with the best quality Laminates, Vinyl Wrap, 2Pak paint finishes, and other quality Polyurethane coating and 2Pak clear lacquers. Our Melbourne designer kitchen services are the best in the business, and help you make your dream home come to life. AOK Kitchens use European hardware including hinges and draw tracks which are selected from the best such as Blum or Hettich. Our expertise and selection of quality materials makes us the top kitchen cabinetmakers in Melbourne. This ensures that your kitchen will be able to stand the test of time. We pride ourselves in customer satisfaction and are specialists in creating high quality, superbly designed cabinets for your kitchen, laundry, bathroom and all your storage needs. When it comes to kitchen cabinets in Melbourne, you can count on AOK Kitchens to deliver high-quality work on time. We welcome you to discuss your ideas and plans with a free no obligation measure and quote.